Editor’s Note: I wanted to pull out these skirmishes and highlight them a day after the two major battles of the Sixth Offensive which occurred on the same day. As a result, this post comes 150 years…and a day, after the events described. On the morning of October 27, 1864, Grant’s Sixth Offensive was in full gear. Benjamin Butler’s Army of the James was probing Confederate defenses on the Darbytown and Williamsburg roads east of Richmond. The Fifth and Ninth Corps of the Army of the Potomac moved west from the line created in the aftermath of the Fifth Offensive southwest of Petersburg, probing the fortifications along the Boydton Plank Road north of Hatcher’s Run. Winfield Scott Hancock had a mobile force consisting of Gregg’s cavalry and several of his own infantry divisions trying to move to the Southside Railroad. The Union brain trust reasoned the Confederates had to be weak somewhere, and he hoped to at the very least prevent them from detaching any more reinforcements from their center. 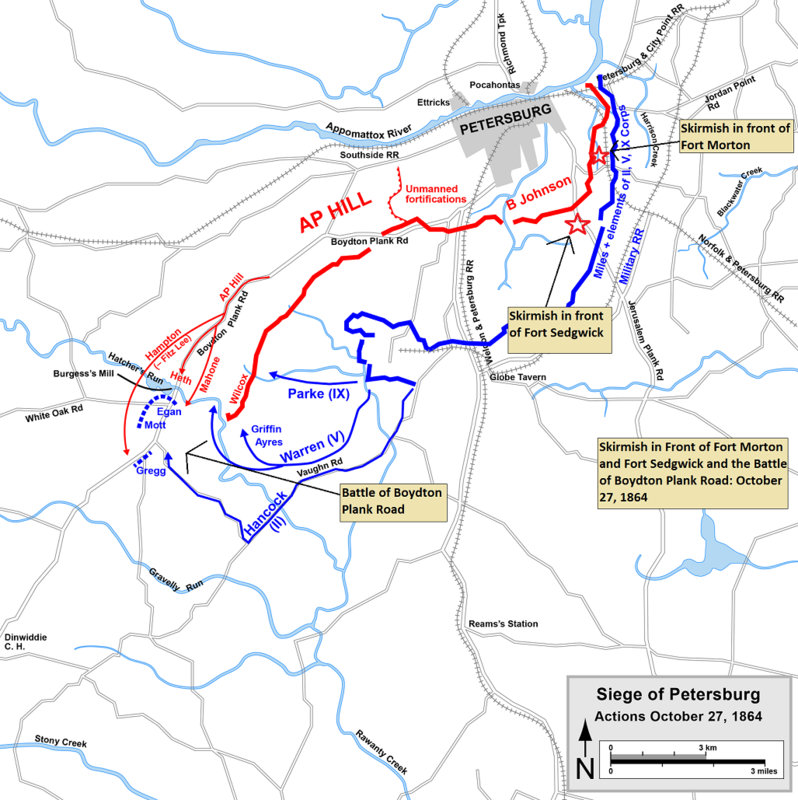 Meanwhile, Miles received reports throughout the day on October 27th indicating that the Confederate lines were weak at several spots opposite his lines. Determined to find out just how weak, that evening Miles carried out Meade’s instructions to demonstrate at two points, opposite Fort Morton east of Petersburg and opposite Fort Sedgwick south of Petersburg. He was stretched thin himself, so the total number of men committed as well as the goal was relatively small. This was to be a demonstration only. The Fort Morton operation was the more ambitious of the two probes. It was aimed at “a small work with one gun in it,” called Fort Crater, and carried out by 100 men of the 148th Pennsylvania under Captain Jeremiah “Jerry” Z. Brown. The skirmish lines in this area near the Crater (aka “Elliott’s Salient”) were incredibly close, only “forty paces” according to Miles’ official report. “Just at dark,” Brown’s men carried axes to chop through the cheveaux-de-frise, and charged on the fort in two columns. One gun from Davidson’s Battery was posted in the fort, but the Confederates believed the attacking party was enemy deserters coming into their lines, and the cannon never fired. 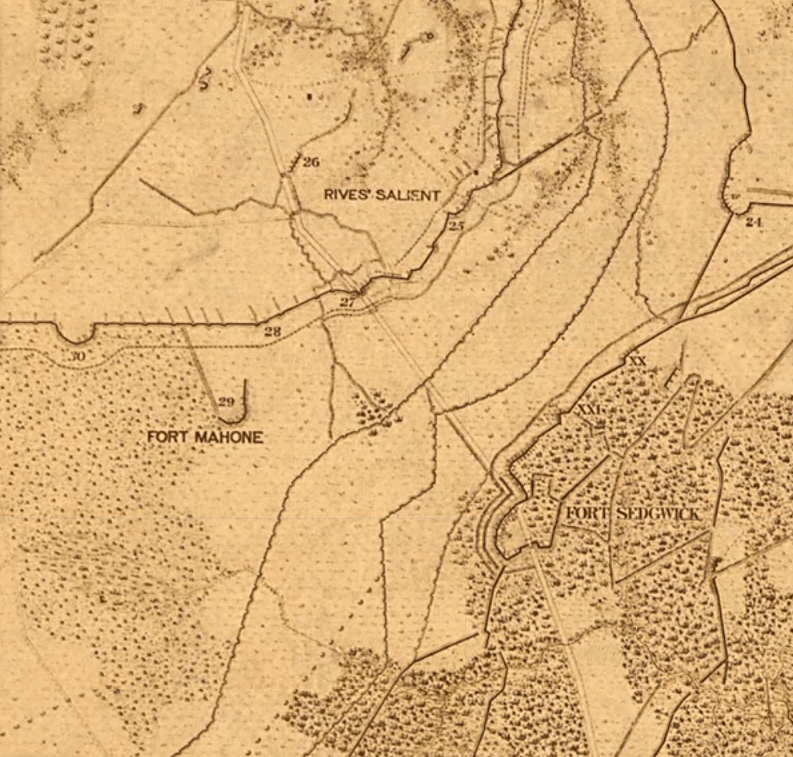 As the Union forces entered the fort from two directions, most of the garrison fled, allowing the men of the 148th Pennsylvania to bag 4 officers and 13 enlisted men of the 34th Virginia and 46th Virginia from Wise’s Brigade, including the Colonel and Lieutenant Colonel of the latter unit. What could have been a stunning success went to waste, as the supports for Brown’s force, the 26th Michigan, arrived too late. This allowed a Confederate counterattack, involving at least the 26th South Carolina, to retake the fort. Lieutenant Henry D. Price of the 116th Pennsylvania, the acting adjutant of Mulholland’s 4th Brigade, 1st Division, 2nd Corps, the 148th’s brigade, was killed in the assault but was lauded for his actions during the fight. The end result was status quo, but Confederate weakness in this sector had been discovered. Brown claimed that in a discussion with General Miles the next day, Miles admitted he had not expected the attack to succeed, that he had planned to make a demonstration only, and that he considered the men as a forlorn hope and a sacrifice! Brown received a Medal of Honor in 1896 for his actions in this fight. For more detailed studies of Civil War units check out Civil War Regiments Journal available from Savas Beatie. This map used with the express written consent of Ted Savas and may NOT be reproduced. All Rights Reserved. Miles was also busy probing south of Petersburg. Regular readers will recall an earlier assault at the Chimneys which had gained a skirmish line on the high ground between Forts Mahone and Sedgwick, a significant advantage. This probe would happen in the same general area. Per Nelson Miles’ report, “[a]bout 8.30 p.m. a party of 130 men, under Lieutenant Colonel D. F. Burke, Eighty-eighth New York, charged the enemy’s picket-line at the Chimneys opposite Fort Sedgwick.” Burke’s men succeeded in capturing the Confederate picket line for 200 yards, an initial success. However, Miles was hesitant to follow up because any reinforcements would reduce the garrison of Fort Sedgwick to such an extent as to make its defense questionable. Also, it was evident the Confederates were preparing to launch a counterattack to retrieve the lost ground. 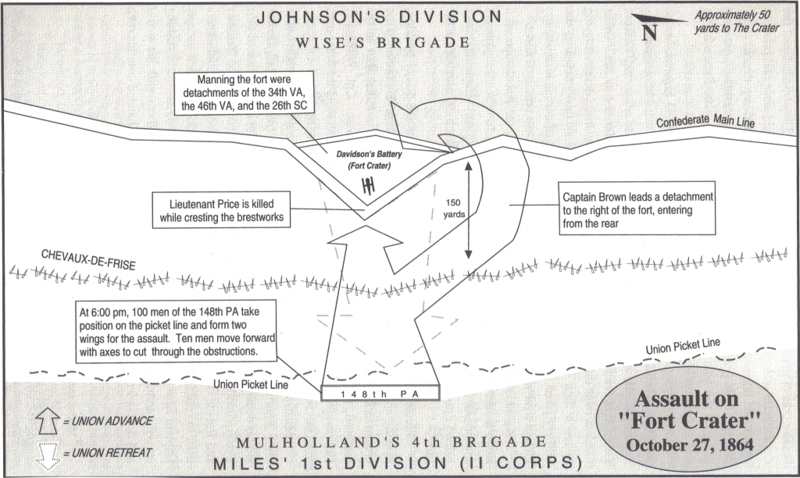 On the Confederate side, Brigadier General William Wallace was organizing 200 men from the Holcombe SC Legion and the 18th South Carolina for that counterattack. Burke was therefore ordered to withdraw after capturing eight prisoners from, presumably, Wallace’s Brigade. Civil War Regiments, Vol. 2, No. 2: 141-55 “Glory Enough: The 148th Pennsylvania Volunteers at Fort Crater.” by Austin C. Brightman, Jr. Note: I encourage all of you to go buy up the remaining volumes of this excellent journal before they are gone for good. Anyone interested in detailed looks at specific regiments in a wide variety of actions in the Civil War will find this article and many others in the pages of Civil War Regiments to be fascinating reading.